The Milky Way as it appears in the night sky: a view of our spiral galaxy from within. Seen from 'above', the spiral structure of our own Milky Way galaxy is a little clearer. A bright band that encircles the entire night sky. The Milky Way is, in fact, the main body of our own spiral galaxy, viewed from within: binoculars or a telescope will resolve individual stars in the bright mass. From Earth, without telescopic aid, the band of the Milky Way appears as a bright and hazy region of light encircling the sky. Many ancient cultures seem to have imagined it as a stream of various kinds. The Egyptians saw it as a river, perhaps the celestial embodiment of the River Nile. The Greeks imagined it as a stream of milk, and from that conception comes our modern term, 'Milky Way'. The Greek word for milk is galaktos, incidentally, and this is the ultimate source for our word 'galaxy'. The brightness of the Milky Way is not constant. In some regions, it is obscured altogether by dark clouds of dust. Prominent among these is the Coalsack, which obscures a large patch of the Milky Way to the south and east of Crux, the Southern Cross. The Milky Way is at its brightest in the sky in and around Sagittarius, and at its least dense in the opposite direction, around the constellation of Taurus. This is due to the Sun's position within the Galactic disc. Sagittarius holds the Galactic Nucleus, and the mass of the Milky Way Galaxy belong to it and its neighbouring constellations. In Taurus, however, we are looking out through much less dense regions to the near edge of the Galaxy. A schematic map of the Milky Way Galaxy. 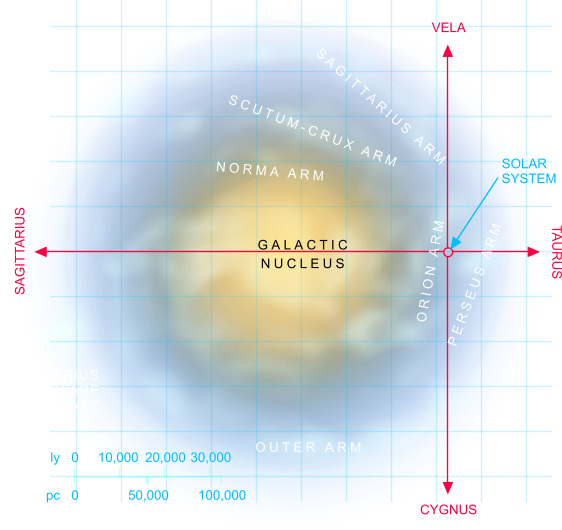 The Solar System lies in a minor 'sub-arm' of the Galaxy known as the Orion Arm. The small circle shown at the point marked 'Solar System' has a radius of 1,000 light years: it includes very nearly all of the stars visible to the naked eye. Strictly, the term 'Milky Way' refers just to the hazy band of light in the night sky. Through popular use, though, it has come to be the accepted term for the spiral galaxy that we call home (though properly this should be referred to simply as 'the Galaxy', with a capital 'G'). In comparison with other galaxies, the Milky Way is unremarkable. Its disc is about 100,000 light years across, or perhaps a little more. This is an extraordinary dimension from our Earth-bound perspective, but not in comparison with other galaxies: the Andromeda Galaxy is roughly twice the size of ours, and other more distant galaxies are more gigantic still. In form, the Milky Way takes the shape of a gently barred spiral, with two especially prominent arms and numerous other minor arms within its structure. Much of the mass of the Galaxy is made up from stars, and the Interstellar Medium of gas and dust from which stars are constantly forming, and which they replenish with heavier elements when they reach their death. The Galaxy's stars are broken down into two distinct populations, Population I and Population II. Population I stars predominate in the arms and disc of the Galaxy. They are younger stars with more complex chemistry, like our own Sun. Much older than these are the Population II stars, which dominate the regions around the core, and are also commonly found in Globular Clusters. Population I stars tend to be bluer, while Population II stars tend to be redder, and this for this reason the Galaxy's core appears yellow-orange, while its outer regions are bluer. This is common phenomenon, often observed in galaxies beyond our own. The stars and the visible matter between them, though, do not account for all the mass of the Galaxy, or even the majority of it. The exact nature of the remaining so-called 'Dark Matter' has yet to be established, but its existence is beyond doubt. Current suspects include a range of yet-to-be-detected particles affecting the gravitational forces within the Milky Way. At the heart of the Galaxy lies an intensely active object known as Sagittarius A*, which is almost certainly a huge black hole. Surrounding this are concentric rings of rapidly expanding matter, evidence of a huge explosion at our Galaxy's core about a million years ago. Surrounding the main disc of the Galaxy are a halo of star clusters known as Globular Clusters. There are about two hundred of these, forming a roughly spherical pattern around the Galaxy. They are large - several hundred light years across - and densely packed with old Population II stars. Several of these are visible to the naked eye, with the brightest being Omega Centauri, nearly 16,000 light years from Earth. 47 Tucanae is another well known example, and there are a crop of these clusters to be found in the constellation of Ophiuchus.